This is going to be difficult, isn’t it? No, no. It’ll be fine. Eggs = breakfast, right? Yes, that’s right. They do equal ‘breakfast’, but that’s the mere tip of the iceberg. All of those ways are superb ways to eat an egg, but egg-appreciation can’t just stop with a couple of rashers of bacon alongside. There’s much more to the humble egg than just that. Think of an egg as a spacecraft. You’ve got to realise exactly what an egg is, and what it’s for. An egg is an incubator. It’s a container that holds the very essence of life itself, with everything that life needs to get a kick-start … protection, food, energy. It’s just like a little self-contained spacecraft, except without the whole rocket and orbiting the earth bit. There sure is. The fact that an egg has all the things on board that are needed to give birth to life means that it’s the most primordial and essential of food. Those nutrients that are intended to nourish a chicken embryo give us a powerful dose of protein, amino acids, minerals and vitamins in a handy, portion-sized shell, and on top of that, it’s so very versatile. Learn the language of the egg – understand completely the amazing and beautiful oblong orb – and you can enter new realms of cooking, rocketing you to stellar heights of culinary achievement. Blimey! I’d better up my game with them there eggs. Where do I start? Funny you should ask. I’ve been engrossed in Ruhlman’s book for weeks now. It’s a superb place to start if you want to find out more about cooking with eggs and the colossal range of things you can do with them. Ruhlman has some pedigree – his earlier book, Charcuterie: The Craft of Salting, Smoking, and Curing, is my most often recommended introduction to curing and preserving meat. That book gives open, no-nonsense, practical guidance on a very tricky subject indeed, and I’ve had some huge successes through using it. Egg is just the same, a comprehensive and well-researched volume of recipes and information that’s both accessible and informative. Yes, get rid of that. 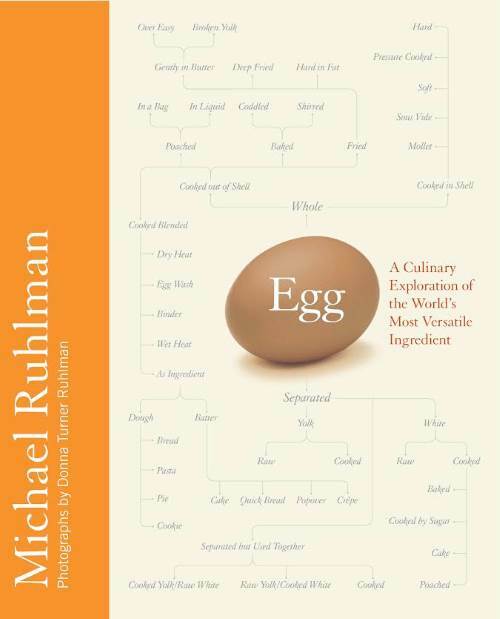 It’s patronising rubbish compared to Ruhlman’s book, which has just a single page method for soft-boiling eggs, and happens to include ‘abundant strong coffee’ and ‘two Bloody Marys’ in the list of required ingredients, alongside two eggs and ‘a gratuitous amount of butter’. There are no Delia-esque photos of simmering water, because you know already what simmering water looks like. Is it just basics like boiled eggs, then? No, of course not, but it’s important to get the techniques for basic things like boiled eggs and omelettes right, because with a few eggs, a pan and a bit of knowledge you’ve got a better, faster meal than any takeaway anywhere can muster. There’s plenty more on top of this, including recipes grouped around the various states of an egg and ways it’s used – cooked in or out of the shell, as an ingredient, broken down into yolk and white. There’s even a fairly handy fold-out flowchart to match recipes to particular uses. As you’d expect, there’s a fair showing for cakes, desserts, and things made with custards. There’s some solid instructions on making pasta, and all the breakfast staples are there. There’s a few enriched breads, such as challa, and even a method for deep-frying an egg, which, quite frankly, looks delicious. OK, worth a look then? Yes, absolutely. This is a very handsome book, that’s beautifully written and presented, about perhaps the most versatile but taken for granted ingredient available to the cook. It’s a great way to start to get more out of your eggs.